22 AWG 9C 7x30 Stranded Tinned Copper Conductor - Aluminum Foil/Polyester Tape/Tinned Copper Braided Shield 65% Overall Foil/TC Braid 65% Beldfoil Shielding - Multi-Conductor Computer Cable - SR-PVC Insulation PVC Jacket CMG FT4 - 300V - Electronics Cable for EIA RS-232 - Chrome BeldenCut Length: 150FT (When ordering a qty of 1 you will receive one roll of cable cut to 150FT. 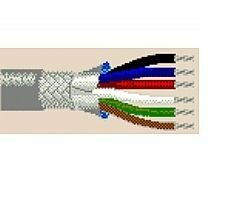 )Color:ChromeConstruction:ConductorVoltage:300VType:CMG FT4Product Family:Electronics CableProduct Type:Computer CableApplication:EIA RS-232Cable Type:Multi-ConductorAWG Size:22No of Conductors:9Conductor:Tinned CopperInsulation:SR-PVCJacket:PVCShielding:Overall Foil/TC Braid 65%MFG:BeldenConductor Stranding:7x30Shield Material:Aluminum Foil/Polyester Tape/Tinned Copper Braided Shield 65%Solid/Stranded:StrandedShield Trade Name:BeldfoilPlenum:NShielded:YReturn Policy: Please order carefully. We cannot accept returns on this cable.